Registration is now open for the 2018 Youth Crop Scouting Competition to be held on July 30th. High school students (those completing grades 9-12) from Iowa are invited to compete and showcase crop scouting abilities in corn and soybean. The competition will be a one day event focusing on outdoor learning. Youth can get out into the fields at the Field Extension Education Laboratory (FEEL) to look for problems and learn about solutions. During the competition youth will have the opportunity to interact with Iowa State University faculty, staff, and agronomists as well as professionals in crop-related careers. Prizes are awarded to the top four teams and the top two teams can advance to the regional competition in Nebraska. All participants will learn, have fun, and take home a free t-shirt. To participate in the competition all you need is a team of 3 to 5 youth and an adult coach. There is no cost for registration. Reimbursement for travel costs is available. 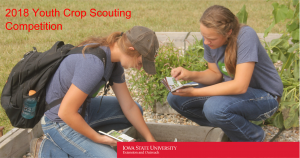 To learn more and to register visit the website https://www.ipm.iastate.edu/crop-scouting-competition-iowa-youth-2018 or contact Maya Hayslett, hayslett@iastate.edu. Location: Field Extension Education Laboratory at 1928 240 St., Boone, IA. Time: Registration begins at 8am. Competition starts at 8:30am and will end by 2:00pm.